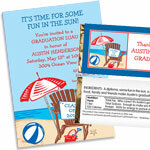 custom personalized graduation party supplies are the perfect choice for your graduation party invitation or grad party favor. A graduation party celebrates both a job well done and a very bright future. The key to a successful celebration is planning your graduation party so the graduate is the center of attention. Our themes, our graduation invitations, party favors and graduation decorations all focus on that single goal: making the graduate a star for a day.